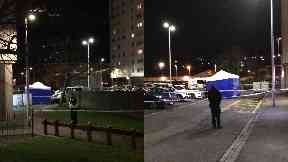 Officers cordoned off the scene at Adamson Court in Dundee on Monday afternoon. Police have launched a major investigation after a person died at a block of flats in Dundee. Officers cordoned off Adamson Court on Kirk Street on Monday afternoon. The death is currently being treated as "unexplained" and officers confirmed there will be a police presence at the scene "for some time". A Police Scotland spokesperson said: "Police Scotland is currently dealing with an unexplained death at Adamson Court, Dundee. "Circumstances surrounding the death are currently under investigation. "There will be a police presence at this locus for some time. "Please note until identification of the deceased is known and next of kin have been made aware there will be no further information passed."